Experiencing Christ's Return-Rapture: the Captain of the Lord's Army has come to lead God's People into the Inheritance. End of our Exodus; arrival of the Inheritance, at the Land of God's Promises, the Resurrection unto Life, (the first resurrection of the two groups of souls resurrected in Rev 20:4-6). so Scripture ceased to be produced upon arrival of the promised inheritance, Christ's coming in His Kingdom. I, John, both your brother and companion in the tribulation and kingdom and patience of Jesus Christ, was on the island that is called Patmos for the word of God and for the testimony of Jesus Christ. 10 I was in the Spirit on the Lord's Day, and I heard behind me a loud voice, as of a trumpet, 11 saying, "I am the Alpha and the Omega, the First and the Last," and, "What you see, write in a book and send it to the seven churches which are in Asia: to Ephesus, to Smyrna, to Pergamos, to Thyatira, to Sardis, to Philadelphia, and to Laodicea." Now I saw heaven opened, and behold, a white horse. And He who sat on him was called Faithful and True, and in righteousness He judges and makes war. 12 His eyes were like a flame of fire, and on His head were many crowns. He had a name written that no one knew except Himself. 13 He was clothed with a robe dipped in blood, and His name is called The Word of God. 14 And the armies in heaven, clothed in fine linen, white and clean, followed Him on white horses. 15 Now out of His mouth goes a sharp sword, that with it He should strike the nations. And He Himself will rule them with a rod of iron. He Himself treads the winepress of the fierceness and wrath of Almighty God. 16 And He has on His robe and on His thigh a name written: KING OF KINGS AND LORD OF LORDS. "Behold, the Lord comes with ten thousands of His saints, 15 to execute judgment on all, to convict all who are ungodly among them of all their ungodly deeds which they have committed in an ungodly way, and of all the harsh things which ungodly sinners have spoken against Him." 70AD: Jerusalem the great is fallen, is fallen! The blowing ot the trumpets for 7 days culminating in the fall of that great city, inaugurating the age of conquest of the Inheritance, the land of promise. Compare with the trumpets in Revelation culminating in the fall of that great city, "Babylon." "At that time the sign of the Son of Man will appear in the sky, and all the nations of the earth will mourn. They will see the Son of Man coming on the clouds of the sky, with power and great glory. 31 And he will send his angels with a loud trumpet call, and they will gather his elect from the four winds, from one end of the heavens to the other. I declare to you, brothers, that flesh and blood cannot inherit the kingdom of God, nor does the perishable inherit the imperishable. 51 Listen, I tell you a mystery: We will not all sleep, but we will all be changed— 52 in a flash, in the twinkling of an eye, at the last trumpet. For the trumpet will sound, the dead will be raised imperishable, and we will be changed. Brothers, we do not want you to be ignorant about those who fall asleep, or to grieve like the rest of men, who have no hope. 14 We believe that Jesus died and rose again and so we believe that God will bring with Jesus those who have fallen asleep in him. 15 According to the Lord's own word, we tell you that we who are still alive, who are left till the coming of the Lord, will certainly not precede those who have fallen asleep. 16 For the Lord himself will come down from heaven, with a loud command, with the voice of the archangel and with the trumpet call of God, and the dead in Christ will rise first. 17 After that, we who are still alive and are left will be caught up together with them in the clouds to meet the Lord in the air. And so we will be with the Lord forever. 18 Therefore encourage each other with these words. "There will be no more delay! 7 But in the days when the seventh angel is about to sound his trumpet, the mystery of God will be accomplished, just as he announced to his servants the prophets." That seventh angel sounding is the last mention of any kind of "trumpet" in the Bible, it is "the last trumpet." 26 And He said, "The kingdom of God is as if a man should scatter seed on the ground, 27 and should sleep by night and rise by day, and the seed should sprout and grow, he himself does not know how. 28 For the earth yields crops by itself: first the blade, then the head, after that the full grain in the head. 29 But when the grain ripens, immediately he puts in the SICKLE, because the harvest has come." another SICKLE that mows down with wrath the tares, the wicked, the unjust. What is interesting is this: they BOTH are harvested with a "sickle." Was the rapture-harvest of the Righteous their mass martyrdom's in the persecutions associated with the Roman-Jewish War? Be patient therefore, brethren, unto the coming of the Lord. Behold, the husbandman waiteth for the precious fruit of the earth, and hath long patience for it, until he receive the early and latter rain. 8 Be ye also patient; stablish your hearts: for the coming of the Lord draweth nigh. The Christians living in that day were literally removed from this earth, being caught away, or raptured by the Lord Jesus and taken to their newly-prepared home in Heaven. The applicable Scripture passages for these two views are found, primarily, in John 14:3; I Cor. 15:50-56; II Cor. 5:1-4; I Thess. 4:14-17; II Thess. 1:3-7. The conclusions that both camps arrive at depend on whether a figurative or covenant interpretation is given to these verses or, on the other hand, whether a literal hermeneutic is applied. The big questions, therefore, are these: Which interpretation more closely fulfills the texts presented above? Further, which view seems to fit both the first century historical setting and the normal expectations of the Christians clinging hard to these promises? 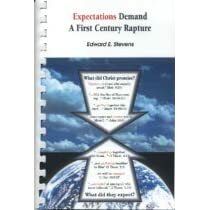 Both of these questions have already been adequately answered by Edward E. Stevens in his book, Expectations Demand a First Century Rapture, and in Ian D. Harding’s book, Taken to Heaven in AD 70. So I will not attempt to repeat what these authors have already done so well. Rather, I want to take a different approach. The balance of this brief article will occupy itself with supporting the literal view by showing that the literal fulfillment was the manner in which all the major New Testament soteriological and eschatological prophecies were consummated, beginning with the Incarnation of Jesus Christ. The Incarnation: The taking upon Himself of human flesh by God the Son, Jesus Christ, was obviously an historically observable event. We have the Babe in Bethlehem, resting in a literal stable, with nearby farm animals, and literal shepherds keeping watch over their flocks by night. We have the frightened Herod seeking a way to destroy who he thought was a threat to his political reign, and bringing death and tragedy to his own countrymen in the process. Yes, the Incarnation of Jesus Christ was fulfilled literally. The Baptism of Jesus: At the beginning of His ministry, Jesus submitted to the baptism of John the Baptist so that all righteousness might be fulfilled (re: Matt. 3:13-17). Jesus literally was baptized in water, saw the Spirit of God descending and alighting on Him, and heard the voice of the Father in Heaven expressing His words of pleasure. This was a literal water baptism, with many spiritual overtones and implications. Gethsemane and Mock Trial: The sufferings of Jesus in the Garden were excruciating demonstrations of the enormous suffering as He was approaching His last days on earth. The trial before Pontius Pilate, with the Jewish chief priests and elders plotting His death, was as unjust a trial as history every witnessed. An innocent Man placed before His accusers, false witnesses brought in, even Pilate finding no fault in Him, nevertheless was pressured by the Jewish leaders to pronounce that dreadful sentence of death. These horrible events were real, literal, historically-verifiable happenings that drove the action to the next crucial and redemptively-necessary event in God’s amazing plan for the salvation of His people. Yes, this was literal suffering, both physical and spiritual. The Crucifixion of Jesus: Then came the climax and focal point of His Incarnation; to die for the sins of His people, satisfy God’s justice in meeting the Law’s demands, and fulfilling all of the Old Covenant’s requirements for the putting away of sin by the sacrifice of Himself, which the sacrifice of the blood of bulls and lambs could never do. The intense suffering came about through the vehicle of the most extreme method of criminal execution ever devised by sinful human beings, crucifixion on a cross. This never-to-be-repeated saga was literal, fulfilling Old Covenant prophecy, but with many on-going redemptive effects and implications that would be central to the salvation interests over the entire past, then-present, and future generations of mankind, and would be forever efficacious. And it was literally accomplished before the very literal eyes of all to see. It was historically verifiable; it was an event that happened on this earth. The Resurrection of Jesus: The third day God raised Him from the dead, for death could not hold Him. He had paid the penalty for the sins of God elect people, and justice under God’s Law had taken place. He was raised in the same body that He was crucified in, with the nail prints and wound in His side manifested for His disciples to see. It was a literal bodily resurrection of the Son of God. He was raised to life, never to die again, and He was seen by over 500 brethren at the same time; indeed, He had conquered death! And He became the firstfruits of all those who would follow in His train, for all whom the Father had given Him, to be the people of God forever! The Ascension of Jesus: Forty days later, after giving ample proof of His victory over death, Jesus Christ ascended to Heaven as His disciples watched Him disappear into a cloud surrounding Him. He was the victorious Christ, ascending to the Throne of His Father in Heaven. The Beloved Disciple John recorded His words in John 14:2 “In My Father’s house are many mansions; if it were not so, I would have told you. I go to prepare a place for you.” He ascended to present His efficacious sacrifice to His Father in an action of fulfilled accomplishment with respect to God’s Law, and to prepare a place for His chosen people to reside for all eternity. This was a literal Ascension of the visible Christ from this earth to the Heavenly realm. The Parousia of Jesus: As the final pages of God’s prophetic disclosure began to unfold with the Roman armies battering at the gates of Jerusalem, the time of Jacob’s trouble bearing down upon the now-apostate city of Jerusalem, and with the Book of Revelation being disclosed before their eyes in stark reality, there was nothing remaining but calamity for what was once a great Jewish nation. God’s judgment had struck the generation of those who crucified God’s own Son sent to be the Messiah of Old Testament prophecy. It was a literal judgment of a literally God-defying people. But it was also a time of great expectancy for that small remnant of faithful believers in Jesus Christ, in Jerusalem and in the known Roman world of that day. These were God’s New Covenant people and those promises of relief from Jewish and Roman persecution that would soon be literally fulfilled. The Second Coming of Christ, the Resurrection of the Dead from out of Hades, the Judgment of the Sheep and the Goats, the Marriage Supper of the Lamb – all would take place literally and coinciding with the Roman armies march, immediately after the tribulation of those days. For then “the Lord Himself will descend from heaven with a shout, the voice of an archangel, and with the trumpet of God. And the dead in Christ shall rise first. When we who are alive and remain shall be caught up together with them in the clouds to meet the Lord in the air (I Thess. 4:16-17). This was a literal “catching up” of all true believers on earth at that time. They were taken from this earth, just as Jesus had promised, “And if I go and prepare a place for you, I will come again and receive you to Myself; that where I am, there you may be also (John 14:3). They were literally given “rest” or “relief” from their persecutors (II Thess. 1:6-8), but note carefully that this promise was given only to those Christians who were living at the time; not to believers in forthcoming generations, who must historically live out their lives before joining that mighty thong of Christians in heaven with Jesus. And note that the promise our Lord gave to these first century believers was that they would be “caught up” to meet the Lord in the air – from off the face of this earth. They were gone! Little wonder that the archives of post AD70 Christian literature is missing from the annals of early writers for perhaps 60 years or more after that magnanimous and historically-unique event. It was a literary vacuum caused by no seasoned Christian leaders in the church to write, but instead, newly converted, immature believers left to propagate the church leading into the centuries ahead. No wonder the church succumbed to rank doctrinal error, even displayed in the writings of the early Church Fathers. Surely, if the living believers of AD 70 had remained on the earth, not only would the I Thess. 4 prophecy not have been fulfilled, but these amazing early church errors would likely have never gotten a foothold in the church, occasioning spiritual declension for the next 1500 years of church history. There can be little doubt that the “catching up” to be with the Lord was literal, and not limited to a mere covenant or positional change, however true that may be from other aspects, occasioned by Christ’s Parousia. Many preterists today are finding it difficult to believe that the AD 70 Rapture took place in a literal fashion. It is the purpose of this brief article to set forth the logic, or if you will, the inspired precedence of the Second Coming being a literal happening, even as all of the previous promises relating to salvation were also fulfilled literally. It should come as no great surprise that God has continually displayed His consummative events in such a manner that they would be logically and openly displayed, at least to the very same people to whom the promises were originally given. Nor was it necessary for our God to satisfy every possible speculation that might arise in the minds of unbelievers surrounding these catastrophic first century events. But from reading the promises from the lips of our Lord and His disciples that certain people or groups of people would actually witness Jesus’ Second Coming, we as Christians living today are required as believers in our Lord Jesus’ promises, by faith, to accept them as requiring a literal fulfillment. To do otherwise, would be to forsake the nature of fulfillment of the earlier major soteriological and eschatological events and say that the Second Coming, alone and for the first time, did not achieve a literal fulfillment that enabled the specific promises to find expression in a historically meaningful way. I, for one, do not wish to embark down that path! From time to time people write and ask how we can believe some of the things we do about Bible prophecy. We simply tell them that we're Bible students just like them, committed to following the truth as we understand it. All of us should be willing to re-study our beliefs and change them if good Biblical reasons can be given. The following shares some of the "Biblical reasons" why we believe Christ's return happened in the First Century. If you can show how we have misunderstood these passages, we will be forever indebted to you. I have always felt a burden to understand all that the Bible had to say. I believed that all of the Bible (even the book of Revelation) could be understood. I knew that the thousands of interpretations could not all be right. Most (if not all) of them had to be wrong. I committed myself to understand Revelation. In my study I came across statements in Revelation and other prophetic writings which disturbed me. I had a professor in a Synoptic Gospels course in college who stirred my anxiety about these things even more. The Revelation of Jesus Christ, which God gave Him to show to His bond-servants, the things which must shortly take place; and He sent and communicated it by His angel to His bond-servant John; who bore witness to the word of God and to the testimony of Jesus Christ, even to all that he saw. Blessed is he who reads and those who hear the words of the prophecy, and heed the things which are written in it; for the time is near. (Rev. 1:1-3). And he said to me, These words are faithful and true; and the Lord, the God of the spirits of the prophets, sent His angel to show to His bond-servants the things which must shortly take place. And behold, I am coming quickly. Blessed is he who heeds the words of the prophecy of this book (22:6,7) . . . And he said to me, Do not seal up the words of the prophecy of this book, for the time is near (22:10) . . . Behold, I am coming quickly, and My reward is with Me to render to every man according to what he has done (22:12) . . . He who testifies to these things says, Yes, I am coming quickly. Amen. Come, Lord Jesus. (Rev.22:20, emphasis mine, ES). I try to put myself back in the first century and think what these words would've meant to saints who were suffering in the persecution. They must have had the impression that Revelation was speaking of events about to be fulfilled in that first century. John seemed so certain that these things "must take place shortly", and that the time of their fulfillment was "near". But this is not all. In numerous statements throughout the Gospels, Jesus promised His return within that generation. And, almost every NT writer indicates that Christ's return was imminent in their generation. If they had only said "maybe", "possibly" or "might" (indefinite), it would make me feel a little easier, but all these statements use definite affirmations like "must", "am" or "is". You too be patient; strengthen your hearts, for the coming of the Lord is at hand. Do not complain, brethren, against one another, that you yourselves may not be judged; behold, the Judge is standing right at the door. (Jas. 5:8,9 emphasis mine, ES). The end of all things is at hand; therefore, be of sound judgment and sober spirit for the purpose of prayer. (1 Pet.4:7; cf. 1 Pet.4:17 where he says it was time for the judgment to begin). For the Son of Man is about to come in the glory of His Father with His angels; and will then recompense every man according to his deeds. Truly I say to you, there are some of those who are standing here who shall not taste death until they see the Son of Man coming in His kingdom. (Matt. 16:27, 28). Truly I say to you, this generation will not pass away until all these things take place. (Matt. 24:34; one of the "things" in the context is Christ's return). I think you probably see why I'm concerned. The professor I spoke of above used these and numerous other passages to "prove" (?) that the NT writings could not be inspired since they contained false prophecies that weren't fulfilled within the time period they predicted. How could the NT writers teach so definitely that the end and Christ's return were near in their generation if those events were actually still thousands of years away? The only reasonable explanation I have heard is the following. The writers of the NT did believe and teach that the end of the Jewish system and return of Christ was near in their generation. They were speaking about the same disastrous events as Jesus was in Matthew 24 where he spoke of the destruction of Jerusalem coming in their generation. Jesus indicated that some kind of "coming of the Son of Man" would happen in 70AD at the destruction of Jerusalem (see Matthew 24). Jesus and the NT writers never mention two different returns of Christ separated by thousands of years (one at 70 A.D. and one still future). So, it seems like we either have to place His second coming back there in the first century at the destruction of Jerusalem or admit that Jesus and the NT writers goofed in their prediction of an imminent return in their generation. The former idea makes more sense and leaves the inspiration of the NT intact. This means that our traditional concepts of Christ's return will have to be re-examined! If Christ returned in 70AD, there are a lot of prophetic passages which need to be reinterpreted. There is a lot more symbolic and figurative language used in the prophetic books than we have ever realized. We have interpreted those things too physically and materialistically. If you see these things differently, I hope you will love me enough to show how I've misinterpreted these things. Help me understand it the right way. I'm anxious to follow what the Bible teaches, just like you. But if you study these passages and come to the same conclusion I did, why not accept it? Isn't truth worth more than career, brotherhood prestige, popularity or materialistic security? What are you afraid of? Hasn't God promised to take care of those who follow Him? To what are you committed, TRUTH or TRADITION? We here at Kingdom Publications have books and other materials available which take this idea further and show how the whole Bible teaches it. Why not check it out? I see room for a circa 70AD rapture of the sort Ed Stevens & Walt Hibbard describe from 1 Thessalonians 4:14-17 that accompanies the John 14:1-3 reality that Jesus brings the New Jerusalem with Him at His Return. (And Rev 21-22's "New Jerusalem" is Hebrews 12:22's "Heavenly Jerusalem" which is Galatians 4:26's "Jerusalem which is above" which is the home Jesus goes away to prepare for us in John 14:1-3. I think we are agreed here, right? Interesting how at Mt. Sinai the leading men and Moses are called upward to meet the LORD at His coming to the Hebrews). It was an interesting night when I happened through Ardmore, OK one Wednesday night to visit Don Preston's church. Don was trying his best to shoot down the idea of any rapture while preaching through the Greek of 1 Thessalonians 4:14-17. But the more evidence from the biblical Greek expressions around the term "parousia" that he brought out, the more he had to honestly admit how it is employed to speak of the ancient practice of local dignitaries meeting together up the road outside their town to welcome and accompany a visiting higher dignitary that final leg of journey. He also had to admit honestly that "air" in v17 is used in ancient Greek for "the atmosphere above." It was so ironic because, as he was quoting commentaries he was expressing his amazement at how the commentators often would occasionally end up providing better evidences for the positions they were straining to refute than the ones they were trying to promote. And here I was witnessing him doing the very same thing. May God bless Don Preston, he is a good guy, however, afterall. So I see a rapture occurring as Jesus is beginning His final descent of Return, (although I have not proved it here but merely mentioned it). And Don Preston inadvertently provided me with more support for my long-held position. For if we believe that Jesus died and rose again, even so them also which sleep in Jesus will God bring with him. 15For this we say unto you by the word of the Lord, that we which are alive and remain unto the coming of the Lord shall not prevent them which are asleep.16For the Lord himself shall descend from heaven with a shout, with the voice of the archangel, and with the trump of God: and the dead in Christ shall rise first: 17Then we which are alive and remain shall be caught up together with them in the clouds, to meet the Lord in the air: and so shall we ever be with the Lord. Two groups become one when they are changed and presented together in the air at the Return of Christ. [Group 1] those that die before Christ's Coming. [Group 2] those that would remain alive unto His Coming. Group 1: whoever believes and dies; shall live [in a new form, a spiritual body]. Group 2: lives and believes; Never die; shall never die [but still be "changed" into the same new form that Group 1 obtains, a spiritual body]. 1 Cor. 15:51. Behold, I tell you a mystery: We [Groups 1 + 2] shall not all sleep [like Group 1], but we shall all be changed [Groups 1 + 2] 52. in a moment, in the twinkling of an eye, at the last trumpet. For the trumpet will sound, and the dead [Group 1] will be raised incorruptible, and we shall be changed [Groups 1 + 2]. 2 Cor. 4:12-14 So then death is working in us [destined for Group 1], but life in you [destined for Group 2]. 13. But since we have the same spirit of faith, according to what is written, "I believed and therefore I spoke,'' we also believe and therefore speak, 14. knowing that He who raised up the Lord Jesus will also raise us [Group 1] up with Jesus, and will present us with you [Groups 1 + 2]. 1 Thes. 4:16. For the Lord Himself will descend from heaven with a shout,with the voice of an archangel, and with the trumpet of God. And the dead in Christ [Group 1] will rise first. 17. Then we who are alive and remain [Group 2] shall be caught up together with them [Group 1] in the clouds to meet the Lord in the air. And thus we shall always be with the Lord [Groups 1 + 2]. Note also that the events that happen to both groups together [Groups 1 + 2] happen AFTER the resurrection of the dead [Group 1]. This is affirmation that the "Resurrection of the Dead" cannot be seen as simply a corporate resurrection or an individual realization of salvation. It is also an indication that "changed" (glorification) is something that follows resurrection (just as, also, damnation). Could someone please explain to me the resurrections at Rev20. I've read many of Don Preston's books, and this question keeps cropping up in my mind. Are the disciples part of the first resurrection or the second resurrection? Nowhere does the Scripture ever use the term "The Second Resurrection." Jesus taught about "The Resurrection of Life" and of "The Resurrection of Damnation," John 5:28-29. Paul predicted "The Resurrection of the Dead, of both the Just and the Unjust," Acts 24:15. The Resurrection of the Unjust Dead (Resurrection of the Rest of the Dead, Resurrection of Damnation). 15 And have hope toward God, which they themselves also allow, that there shall [future to 58AD] be a resurrection of the dead, both of the just and unjust. I saw THE SOULS of them that were beheaded for the witness of Jesus, and for the word of God, and which had not worshipped the beast, neither his image, neither had received his mark upon their foreheads, or in their hands; and they lived and reigned with Christ a thousand years. 5 (But the rest of the dead lived not again until the thousand years were finished). This is the first resurrection: 6 Blessed and holy is he that hath part in the first resurrection, on such the second death hath no power, but they shall [future to 63AD] be priests of God and of Christ, and shall [future to 63AD] reign with him a thousand years. So, to which of these two Resurrections was Paul striving to attain? B) that of "The Rest of the Dead"
Was it not the Resurrection to Life, the First Resurrection Christians were concerned about? WHO DID JESUS PROMISE TO RAISE UP AT THE LAST DAY? WHEN? So, WHEN does Preterism calculate the Last Day to have arrived? 70AD, right? Still within THAT GENERATION, right? 16 For the Lord himself will come down from heaven, with a loud command, with the voice of the archangel and with the trumpet call of God, and THE DEAD IN CHRIST will [future to 51AD] RISE FIRST. This is the FIRST RESURRECTION. 6 Blessed and holy are those who have part in the FIRST RESURRECTION. The second death has no power over them, but they will [future to 63AD] be priests of God and of Christ and will [future to 63AD] reign with Him for a thousand years. RED = PRESENT or PAST tense, what they ALREADY HAD BEFORE the Lord’s 70AD Return. BLUE = FUTURE tense, what they WILL HAVE AFTER the Lord’s 70AD Return. Matthew 25:14-25 ~ as told by Jesus a few days before the Cross & Ascension around 30AD. 14 "For the Kingdom of the Heavens is like a man traveling to a far country, who called his own servants and delivered his goods to them. 15 And to one he gave five talents, to another two, and to another one, to each according to his own ability; and immediately he went on a journey. 16 Then he who had received the five talents went and traded with them, and made another five talents. 17 And likewise he who had received two gained two more also. 18 But he who had received one went and dug in the ground, and hid his lord's money. 19 AFTER A LONG TIME THE LORD of those servants CAME and SETTLED ACCOUNTS (JUDGED) with them. 26 "But his lord answered and said to him, 'You wicked and lazy servant, you knew that I reap where I have not sown, and gather where I have not scattered seed. 27 So you OUGHT TO HAVE (PAST TENSE) deposited my money with the bankers, and AT MY COMING [70AD] I would have received back my own with interest. 28 So take the talent from him, and give it to him who has ten talents. Remember, JESUS WAS THE ONE WHO SAID THESE THINGS back around 30AD, a few days before going to the Cross; then the Ascension 40 days later. Notice how THE SERVANTS ARE NOT MADE RULERS OVER MANY THINGS UNTIL AFTER THEIR LORD RETURNS. Now WHEN DOES PRETERISM SAY THAT THE LORD RETURNED? 70AD, NO? So then, WHEN WERE CHRIST'S DISCIPLES MADE RULERS WITH CHRIST? NOT UNTIL AFTER THEIR LORD RETURNED IN 70AD. You do not get a kingdom without a king, and you do not reign with Christ before Christ Returns with His Kingdom to reign: 70AD. BLUE = FUTURE tense, what they WILL HAVE AT the Lord’s 70AD Return. 1 Thessalonians 4:13-18 ~ written around 51AD. Remember, CHRIST’S APOSTLE PAUL WAS THE ONE WHO WROTE THESE THINGS back around 51AD. Now let us see how this fits in with the 63AD account how Christ’s Apostle John foresaw the dead in Christ, the souls of those who had been slain for the Gospel, the souls of those who had refused to worship the Beast (Nero), refused to worship his image or refused to receive his mark. John foresaw the dead in Christ become enthroned and come to life and John declares that they WILL BE made to reign with Christ - all at the beginning of "The Thousand Years," (Revelation 20:4-6). Revelation 20:4-6 And I foresaw thrones, and they sat upon them, and judgment was given to them. And I foresaw the souls of those who HAD BEEN BEHEADED because of the testimony of Jesus and because of the word of God, and those who HAD NOT WORSHIPED the Beast or his image, and HAD NOT RECEIVED upon their forehead and upon their hand;and they came to life and reigned with Christ for a thousand years. 5 The rest of the dead did not come to life until the thousand years were completed. This is the first resurrection, ["The dead in Christ WILL RISE First," 1 Thes 4:16]. 6 Blessed and holy is the one who has a part in the first resurrection, ["The dead in Christ WILL RISE rise First" 1 Thes 4:16]; over these the second death has no power, but they WILL BE [future to 63AD] priests of God and of Christ and WILL REIGN WITH HIM [future to 63AD] for a thousand years. We see above here in the vision Jesus gave to John that those who HAD BEEN beheaded for the Gospel's sake and HAD BEEN martyred because they HAD refused to worship the Beast (Nero) or his image, HAD refused to receive the Beast's (Nero's) mark upon their foreheads or hands, were foreseen to become enthroned, to come to life (John 6:54) and prophesied that they WILL BE made rulers (Matthew 25:19-23 and Luke 19:12-19) at Christ's 70AD Return upon arrival of the long anticipated "Last Day.” This was to be “the Resurrection the First,"(as the Greek puts it). Christ's 70AD Return at “The Last Day” marks the Resurrection of those having eternal life, (being regular partakers of the Supper of the Lord), John 6:54, and the beginning of His reign with His faithful servants (Mat 25:19-23 and Luke 19:12-19). The last day of the week, the Lord’s Sabbath day, was a type and shadow of the long anticipated, “The Last Day" = “The Day of the Lord.” All fires were to go out on the last day of the week, the Sabbath: Moses stoned a man for gathering sticks. Upon arrival of “The Last Day,” all the fires of animal sacrifices, all the fires of the last physical Temple were once and for all put out. The last day of the Old Testament system at 70AD was the first day of the New Testament vindication & Judgment, the first day of Revelation 20:1-10’s sealing Satan bound & cast into the Bottomless Pit, the first day of the enthroning & Resurrection of the First (the Just), the first day of "The Thousand Years." Jesus raised up at the Last Day all those who already had eternal life, John 6:54, which occurred the moment He began His descent of Return, 1 Thess 4:16. This was the fulfillment of what John foresaw in the vision of Rev 20:4, that was still future according to Rev 1:1 and Rev 4:1. The Day of God, the Day of the Lord, the Day of Rest, the Last Day had finally arrived. Notice how Christ's Apostle Peter does NOT write, “Well, with the Lord one day is as a 1000 years, or as an even 40, maybe a shag less than 14 years, or not: the Lord really cannot tell time.” No, with godly fear Peter doggedly sticks to the formula given to him by inspiration, saying it two times, both ways, really emphasizing that no matter which way you come at it, no matter which way readers try to slice it or dice it, it is clear: “With the Lord: '1 Day' = 1000 years, 1000 years = '1 Day. '” And He says it twice because the matter is certain, Gen 41:32. Notice again how unmistakebly clear Jesus promised “those who HATH (present tense) eternal life" that “they WILL BE (future tense) resurrected by the Lord at the Last Day,” [70AD]. When? Did He say they will be raised a week later? A year later? In 5 years? He said he personally would raise them up AT THE LAST DAY. When does Preterism calculate “The Last Day” to have come? 70AD. Again, WHEN DOES PRETERISM CALCULATE "THE LAST DAY" TO HAVE COME? 70AD, RIGHT? Let us take a look at a second of Jesus' predictive parables, very similar to the first one at the top of this post. 11 And while they were listening to these things, He went on to tell a parable, because He was near Jerusalem, and they supposed that the kingdom of God was going to appear immediately, [Jesus tells this parable to correct their error = "they supposed the Kingdom of God was going to appear immediately"]. 12 He said therefore, "A certain nobleman went to a distant country to receive a kingdom for himself, and then RETURN. 13 "And he called ten of his slaves, and gave them ten minas, and said to them, 'Do business with this until I come back.' 14 "But his citizens hated him, and sent a delegation after him, saying, 'We do not want this man to reign over us.' 15 "And it came about that WHEN HE RETURNED, AFTER RECEIVING THE KINGDOM, he ordered that these slaves, to whom he had given the money, be called to him in order that he might know what business they had done, [JUDGEMENT]. 16 "And the first appeared, saying, 'Master, your mina has made ten minas more.' 17 "And he said to him, 'Well done, good slave, because you HAVE BEEN [PAST TENSE] faithful in a very little thing, be in authority [REIGN] over ten cities.' 18 "And the second came, saying, 'Your mina, master, has made five minas.' 19 "And he said to him also, 'And you are to be [REIGN] over five cities.' 20 "And another came, saying, 'Master, behold your mina, which I kept put away in a handkerchief; 21 for I was afraid of you, because you are an exacting man; you take up what you did not lay down, and reap what you did not sow.' 22 "He said to him, 'By your own words I WILL JUDGE YOU, you worthless slave. Did you know that I am an exacting man, taking up what I did not lay down, and reaping what I did not sow? 23 'Then why DID [PAST TENSE] you not put the money in the bank, and HAVING COME [AFTERWARD], I would have collected it with interest?' 24 "And he said to the bystanders, 'Take the mina away from him, and give it to the one who has the ten minas.' 25 "And they said to him, 'Master, he has ten minas already.' 26 "I tell you, that to everyone who has [PRESENT TENSE] shall [FUTURE TENSE] more be given, but from the one who does not have [PRESENT TENSE], even what he does have SHALL BE [FUTURE TENSE] taken away. 27 "But these enemies of mine, who DID [PAST TENSE] not want me to reign over them,bring them here and slay them in my presence, [IN MY PAROUSIA]." Note: It should not go without mention that everything posted here has long been a studied, settled, and accepted by the broadest spectrum of global, historic Christianity. The ONLY novel or innovative concept here is the Preterist idea that places the arrival of "Tthe Last Day" at 70AD. This book written in 1878, is the most popular introduction to and defense of the preterist view of Bible prophecy in print today. Most theologians in Europe a century ago took a preterist approach, so it is not surprising to read some of Russell's well-known contemporaries say nice things about his book. Charles H. Spurgeon, who did not hold to the preterist view, stated that the book "...throws so much new light upon obscure portions of the Scriptures, and is accompanied with so much critical research and close reasoning that it can be injurious to none and may be profitable to all." Dr. R.C. Sproul (Ligonier Ministries) states, "I believe that Rusell's work is one of the most important treatments on Biblical eschatology that is availbable to the church today." Gary DeMar says that Russell's book is a breath of fresh air in a room filled with smoke and mirror hermeneutics. The first book from a Preterist in this generation teaching a literal rapture of all true Christians at the time of the Parousia in AD 66-70. Five scholars a century ago (J. S. Russell, Milton S. Terry, Richard Weymouth, William S. Urmy, and Ernest Hampden-Cook) took a similar view. This book takes their somewhat sketchy theory and fully develops it. Includes answers to all the major objections and a phrase-by-phrase grammatical analysis of the rapture text (1 Thess. 4:13-18). Ground-breaking new work. The "next wave" in Preterism! Walt Hibbard, Arthur Melanson, and many others join with Stevens in offering this theory for your consideration. Harding examines every NT text that says anything about what the first century Christians EXPECTED to experience at the Parousia. He exhaustively proves from scripture that those saints not only expected to KNOW when Jesus returned, but to see, hear, and experience it in a literally TRANSFORMING way (by being "changed" and "caught up" into the air to meet with Jesus at His descent from heaven at the Parousia). 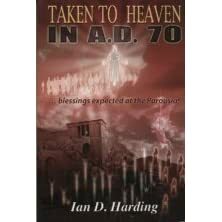 If you are looking for a book which argues the case for a literal rapture in AD 70 strictly from Scripture, this is it! This will be one of the defining books of the Preterist Reformation for all generations to come. A "must read" for all preterists!